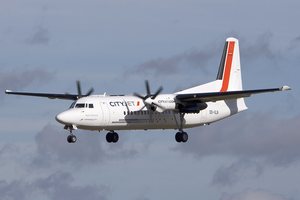 On 6 November 2002, Luxair Flight 9642, a Fokker 50 aircraft en route to Luxembourg – Findel Airport crashed and burned on final approach to the airport about six nautical miles (11 km) short of the runway while trying to land in the fog. 20 out of 22 passengers and crew perished. ^ Flight International, 3–9 October 2006. ^ "World Airline Census 2018". Flightglobal.com. Retrieved 26 August 2018. ^ "Fokker 50 - Basics" (PDF). Fokker Services. ^ "Fokker 50 - Performance" (PDF). Fokker Services. ^ a b "Fokker 50 - Interior" (PDF). Fokker Services. ^ "Type certificate data sheet No. IM.E.041 for PW100 series engines" (PDF). EASA. 8 March 2018. This page was last edited on 15 April 2019, at 10:21 (UTC).